The Affinia Manhattan is perfect as a base for a New York visit; as well as being located right in the central area of New York’s main tourist attractions, the staff are friendly and aim to give each guest a memorable visit for all the right reasons! Regardless of whether you’ve visited the city before, or you’re a New York newbie, this hotel is a great find. For those who want to relax at the hotel after a long day of exploring the city, the Affinia Manhattan offers in-room spa treatments. Whether you want a massage to relieve tired legs or a manicure to pamper yourself, there are a range of treatments available. In contrast, for those folks who can’t relax on holiday, the hotel also has a fitness centre for when you can’t bear to miss your workout. There’s also a business centre with computer, printer and fax services in case you need to connect to the office whilst you’re away. . 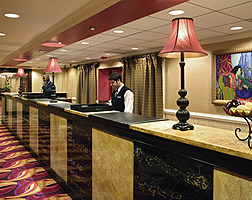 The hotel’s concierge is a much praised facility; for guests looking to book tables at popular restaurants, Broadway shows or tickets to tourist attractions the concierge should be the first stop. With insider knowledge of the city, they’re a great resource for your stay – even if you have an unusual request! The hotel also includes a boarding pass kiosk where guests can print their boarding pass – taking the stress out of travelling! Hotel staff can even arrange for groceries to be delivered to the hotel rooms of guests – particularly useful for those staying in rooms with a kitchenette facility.